Women's VestTM (Adjustable Height) Contoured 1 to 21 lb. Weighted Vest Supplied at 11 pounds Women's VestTM is IRONWEAR's TM new patented weighted vest designed exclusively for the female form. 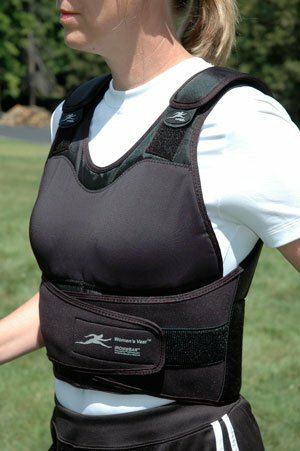 The Women's VestTM was created to make wearing a weighted vest more comfortable and effective for women. Women's VestTM has a unique design that contours to the shape of a women's body, does not apply downward pressure to the chest, expands to support a wide range of sizes, is height adjustable, supports abdominal and back muscles, and helps to improve posture. Women's VestTM does not apply downward pressure to your chest. With the Women's Vest'sTM all the front weights are located below your chest near your abdominal muscles. The patented support structure leaves the chest area open so pressure is not applied to your chest by the weights or weight support structure. Women's VestTM is height adjustable so that the cup area can be positioned properly over your chest. The Women's VestTM includes two patented Double LockTM padded shoulder straps, which allow you to adjust the Women's VestTM up and down easily. The Women's VestTM can be adjusted to fit women from below 5 feet to over 6 feet tall. Women's VestTM has 20 weight pockets into which one or two ½ pound soft Flex-metalTM weights can be inserted. The vest comes with one weight per pocket and the vest shell itself weights approximately one pound. The vest can be adjusted from 1 to 21 pounds. Women's VestTM is supplied at 11 pounds with a single layer of Flex-metalTM weights, but can be adjusted from about 1 pound up to 21 pounds by removing or adding additional ½ pound Flex-metalTM weights. (Adjustable Height) Contoured 1 to 21 lb. Weighted Vest Supplied at 11lbs.